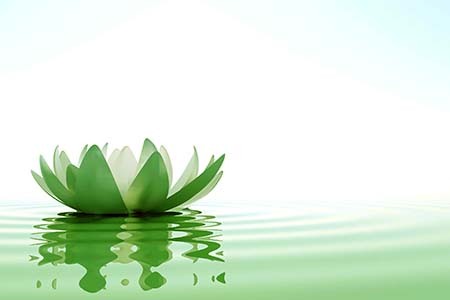 traditional Buddhist Insight (mindfulness) meditation but without too much ritual. and experience the twinned practices of walking and sitting meditation. This way of practising meditation combines heightened concentration with authentic awareness of the stream of present moments. Although it dates from over 2,500 years ago, the practice of Vipassana meditation is timeless and exquisitely relevant to the intelligent seeker of today. A typical morning will include an opening activity and discussion, walking meditation sitting meditation, feedback, a Dhamma talk and discussion. Usually Monday to Thursday from 10 am to 1 pm. The fee for the combined four sessions is 8,000 baht per person to be paid on the first morning. A formal application (see below) and a deposit (1,000 Baht) are required for each person. The four mornings together will give an experiential overview of traditional Buddhist Vipassana Meditation. The four sessions in the series will give the participants the essential information and hands-on experience that they will require to continue to practice on their own or in a Thai meditation centre or the meditation section of a temple. Acharn Helen is a Vipassana acharn, an author, a visual artist, an editor and frequency healer. 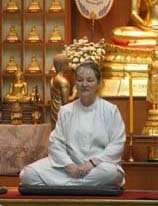 British born, she has lived in Thailand for more than 40 years bringing up her family and sharing her extensive experience and knowledge of traditional Buddhist Vipassana Meditation. She was ordained with the Mook Rim Society (Korean Zen) for eleven years and now works as a spiritual independent running workshops and courses at The House of Dhamma. She worked with Mahachulalongkorn Buddhist University - MCU. and the Young Buddhists Association of Thailand – YBAT for many years. 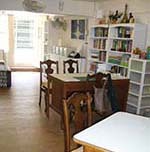 On invitation, she has travelled to run courses and retreats in Austria, Australia and the USA. In 2002, on the occasion of International Women’s Day, she was honoured as the Foremost Western Woman Meditation Master in South-east Asia. To apply, please answer the questions below to an e-mail and send your answers to dhamma.art@gmail.com at least 5 days before the starting date of the course you would like to attend. and payment details. You will receive confirmation of your place, when the deposit is received.